The Atlantic hurricane season began June 1, 2010 and runs until November 30, 2010. We’re 54 days into the season with not much happening. Thus far, according to the National Hurricane Center we’ve had one hurricane (Alex), one named tropical storm (Bonnie, which just fizzled out and apparently hasn’t caused any big problems for the Gulf oil spill like the media have been screaming), and one unnamed tropical depression (Tropical Depression Two). This prompts my question “So, where’s all the hurricanes?” Normally I don’t think I would care all that much about how many hurricanes but for the predictions made earlier this year by Colorado State University and NOAA. Since we’ve had all the wild predictions about global warming causing more hurricanes, I’ve become interested. From Colorado State University we got….. They predict that 15 named tropical storms will form in the Atlantic Ocean, Caribbean Sea and Gulf of Mexico this year, of which 8 will become hurricanes. And of those eight, four are expected to be major hurricanes — Categories 3, 4 or 5 — with maximum wind speeds of 111 mph or greater. The federal National Oceanic and Atmospheric Administrationcalled for an “active” to “extremely active” hurricane season this year. They predict anywhere from 14 to 23 named storms will form in the Atlantic Basin. Of those named storms, eight to 14 should become hurricanes, including three to seven “major” hurricanes with wind speeds above 111 mph. They’ve never predicted a more prolific Atlantic hurricane season. So far their predictions don’t seem to be coming true. I know we have awhile until hurricane season is over and things could change, but we’re certainly not off to a very good start prediction-wise. Let’s see how CSU’s record stands for the 2009 Atlantic hurricane season. 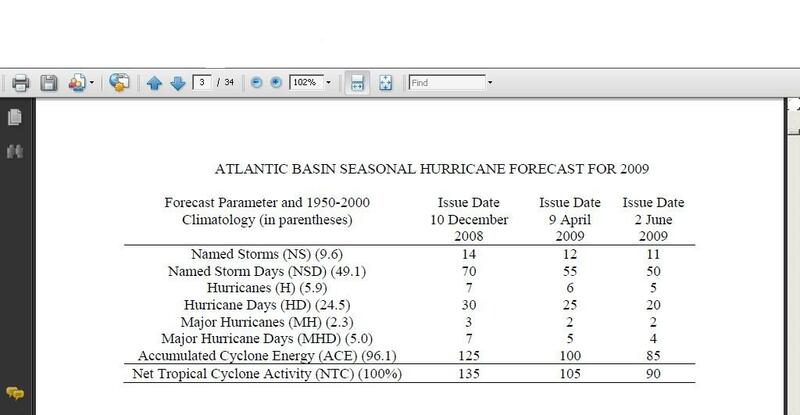 As of June, 2009 they predicted 11 named storms, 5 hurricanes, and 2 major hurricanes as you can see from the below originating with this PDF from CSU. 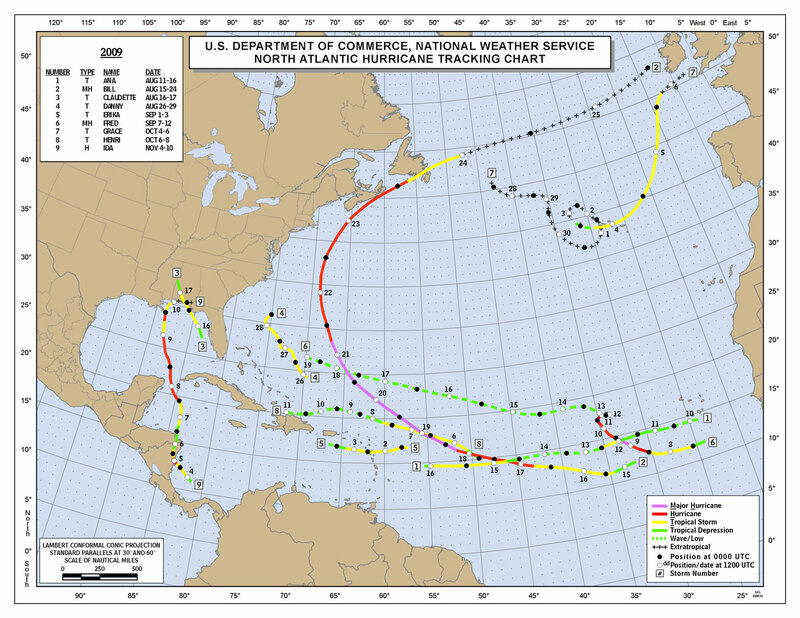 What we actually had in 2009, per NOAA here, was 2 tropical depressions, 6 tropical storms and 3 hurricanes, you can see the storm track chart below. 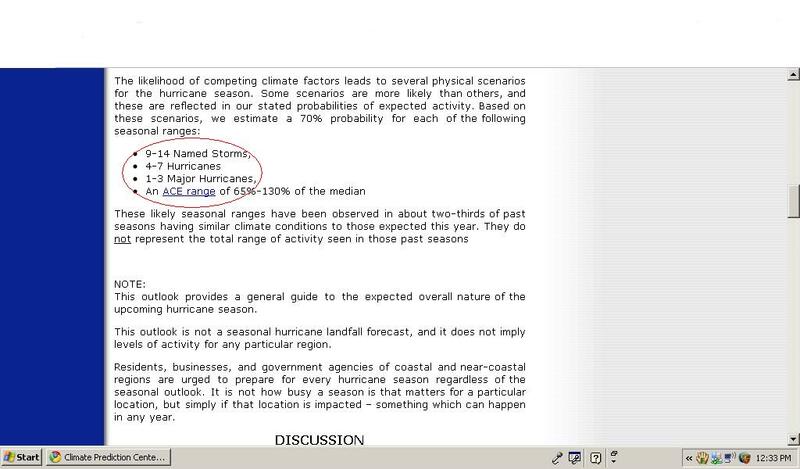 So what did NOAA predict for the 20o9 Atlantic hurricane season? You can see the below from their website here. You can see for yourself their record for 2009 and make your own judgement. I’m not going to predict anything, as I fail to see how you can do more than make an educated guess, regardless if you’re a scientist or not. I remember most of my life complaining that being a weatherman was one of the few, if only professions where you can screw-up with regularity and still get your paycheck every week. Most of my life weather accuracy hasn’t been that important to me. The shrill forecasts of global warming causing increased and larger hurricanes has stepped up the importance of their accuracy to me. I now watch and wonder if they’re forecasts will be correct or not. I do suppose that no matter what happens this Atlantic hurricane season, the “warmers” will be saying it’s caused by global warming. Everything is, you know. Comments Off on So,where’s all the hurricanes?